The latest news from Cairo is that ousted president Hosni Mubarak is to face trial all over again, both on charges from which he was acquitted a year ago (corruption) and on those he was convicted on (the killing of demonstrators). The retrial was ordered speedily, even strangely, by the standards of Western legal procedure. Nothing about it is clear and nobody can reliably interpret what happened. It could be presented as a legal victory for Mubarak. At the same time, it might well be another vindictive move to distract the public from its daily woes and from the undeniable failings of the new administration. The latter is the likelier explanation. It is less plausible that the elderly and ill Mubarak won a court battle and that the Egyptian legal establishment gave him an even break in defiance of the country’s new Muslim overlords, whose antagonism to Mubarak is no secret. Egypt’s judiciary was never independent of government manipulation and is less likely now than ever to take on the powers that be. The Muslim Brotherhood regime under Mohamed Morsi had altogether stifled the courts by pronouncing Morsi immune from judicial scrutiny. Morsi handily won a referendum on the issue. 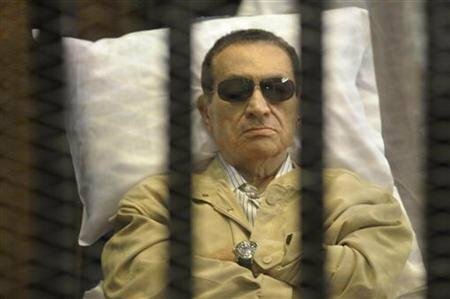 Mubarak’s first trial (despite its mixed verdict and life imprisonment instead of capital punishment) bore all the hallmarks of a show trial, which serves the propaganda purposes of the rulers, is geared to intimidate would-be dissidents and whose verdict and retributive sentences have been pre-determined. The odds are that we are in for another show trial, more entertainment for the masses and more fodder for the mob. Egypt will be hurled back to the trauma of two years ago and its new leaders probably hope that this will ease the pressure on them. The international community does not seem to care. Although they once honored and feted Mubarak, world leaders abruptly changed tack, branded him a tyrannical ogre and cheered his opponents as harbingers of the “Arab Spring.” The truth is that while hardly a democratic paragon, Mubarak was not the worst of Mideastern autocrats. The so-called “Arab Spring” has evolved into something that ought to trouble the free world deeply and not be put out of mind and off the global agenda. It is not Mubarak’s fate that is important here but the rubber-stamp decisions produced by judges, in all probability after behind-the-scenes collusion between the Muslim Brotherhood and Egypt’s still potent military establishment. The latter remain a factor to be reckoned with even if its aging top echelon has been sacrificed. The revolution did not change what was amiss in Egypt. Under Mubarak, the judges did his bidding. Under Morsi and his new constitution, the judges have resumed obeying orders from above. The more things change the more they stay the same, regardless of the gross misperceptions and mesmerized wishful thinking in Western Europe and America. Politicians with axes to grind, academicians and opinion-molders appear to believe that democracy can be instantly conjured. But democracy is not defined by screaming throngs in the streets – vehement protests can be readily orchestrated by anti-democratic agitators. Democracy is not solely defined by elections – many a despot has taken power apparently via the ballot box. Democracy is a far more complex composite, which includes an unbridled critical press, fearless free expression and – foremost – protecting the lot, a truly autonomous judiciary. The Obama administration and the EU appear to have been ignored all this in their alacrity to embrace Morsi. The Mubarak retrial constitutes another reminder that we have reason to worry. SO glad you’re back! I’m not sure any version of democracy we would recognize as such (other than the vote) is even possible with a shariah based consitution. GREAT to have you back Sarah ! I hope, that Morsi will become the next Mubarak…and that Egypt will fall from the cliff…more sooner then later ! Welcome back Sarah…just in time to see Arab Spring morph into deepest Arab Winter. Somehow we’ve managed to remain untouched by it. We continue to witness one disastrous US foreign policy failure after another from Egypt to Libya (which has now spilled over into Mali and Algeria). We’ve seen the results of the reprobate empire’s long,wasteful, futile,democracy wars in Afghanistan and Iraq (more failure, strengthening of Iran) and it begs two questions. Why the hell is Israel looking to the U.S. for anything let alone peace under their land for jihad and rockets over Israel Road Map ? When will Israel start acting like a sovereign nation and end it’s vassal servitude to the collapsing empire ? Glad you’re back – I hope the absence and vacation re-energised you. However my need for clear, fair and balanced and intelligent comment was left in a vacuum whilst you were away. How long will it be before the world understands that Morsi and his band of brigands care not one jot for the America, the West and Israel – but will always grovelling accept free handouts. Your article crystallised succinctly the issues at hand in regard to this issue. Thank you, Ms. Honig…for words of wisdom coming from the Holy Land, once again. Democracy under totalitarians cannot be anything more than the majority rules(read: mob rule), because the other branches of government are corrupt, and there’s no true separation of powers; thus no branch of government acts as a check on any other branch. Perhaps Mohammed Morsi can be forced from power in some way. Does Egypt have some intractible problem, that will only go away with foreign help? If so, Morsi might be forced to make a compromise that will allow dissident parties a voice in Egypt’s parliament. I doubt such a scenario would occur; Islam militates against it. But show trials can only carry Morsi so far. After all, how many of them can he have, before the dissidents grow weary of them? those in Iran. Their objectives also appear to be nebulous in both countries. Wonderful that you have returned. I agree that Morsi and his henchman are trying to distract the citizens of Egypt. The question I would like answered is Why have the US and the EU armed and supported the so called ‘Arab Spring’ in Libya, Egypt and Syria? They do not have any meaningful democracy, but new Islamic and Muslim Brotherhood regimes that are strongly anti-West and anti- Israel. Perhaps you could do another post to follow this excellent one. So far, the Arab spring (convenience terminology) has and will continue to propagate and assert regimes based upon Sharia’s principles, and/or any other Arab religious credos. This is more complex that just a change: Islamic credos have many variations, Sunni, Chia, etc. So, gear for the worse.